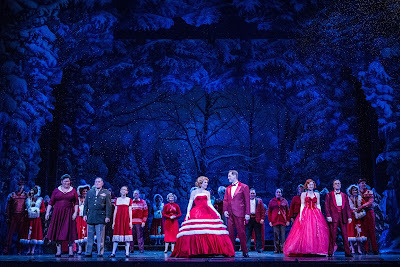 Nature cooperated with the Ordway this week, providing a suitable snowy setting for its new staging of Irving Berlin's White Christmas. 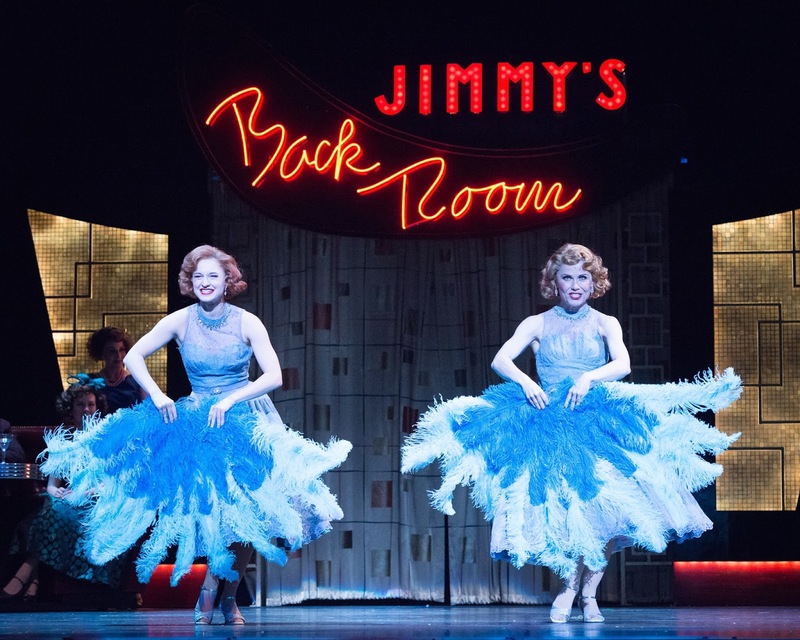 Based on the 1954 holiday film, the stage version is relatively new, having first played at the Ordway in 2006, in a memorable production that landed on Broadway two years later. The Ordway's new production resembles that production, right down to costume and set designs. The musical introduces Bob Wallace (Dieter Bierbrauer) and Phil Davis (Brian Sostek) serving in WWII under General Waverly (James Detmar). Skip ahead ten years, and now it's 1954, where Wallace and Davis have turned their Christmas variety show into an act that is often featured on the Ed Sullivan show, where another of their Army buddies, Ralph Sheldrake (the always-delightful Randy Schmeling), is a producer. Jenny Piersol as Judy Haynes and Ann Michels as Betty Haynes. As a favor to yet another army buddy, the guys check out his sisters in their act (it's always about who you know!). They're impressed with the Haynes sisters, and Phil conspires with Judy Haynes (Jenny Piersol) to throw Bob and Betty (Ann Michels) together. Soon they're all on a train headed to Vermont, where the sisters are booked for the holidays. Unseasonable heat is ruining business at the inn, which happens to be owned by General Waverly. Wallace and Davis decide to move their holiday show rehearsals to the inn to help out their old commanding officer. Rehearsal scenes allow plenty of opportunity for the cast to perform many of Irving Berlin's loveliest tunes. Bob Wallace, and Thomasina Petrus as Martha Watson. And when Thomasina Petrus takes the stage as Martha Watson, the General's second-in-command at the inn, the show kicks into high gear, Thomasina Petrus is a joy to behold. In addition to running the inn, Watson has a history in show business. Her show-stopping rendition of "Let Me Sing and I'm Happy" makes me wish for the days when characters would reprise a show-stopping song. The "let's put on a show" part of the story means that most of the songs can stand alone rather than being shoehorned into the plot, which is a relief after seeing some other jukebox musicals. A highlight at the top of the second act is "I Love a Piano," danced beautifully and athletically by Phil and Judy with the ensemble. Brian Sostek is a local treasure for his ability to combine dance and comedy, and it's great to see him really master this very traditional musical theater role. Jenny Piersol matches him step for step in the dances. Brian Sostek as Phil Davis and Jenny Piersol as Judy Haynes. Songs are sung, misunderstandings cause rifts that will later mend, and there are some corny jokes. 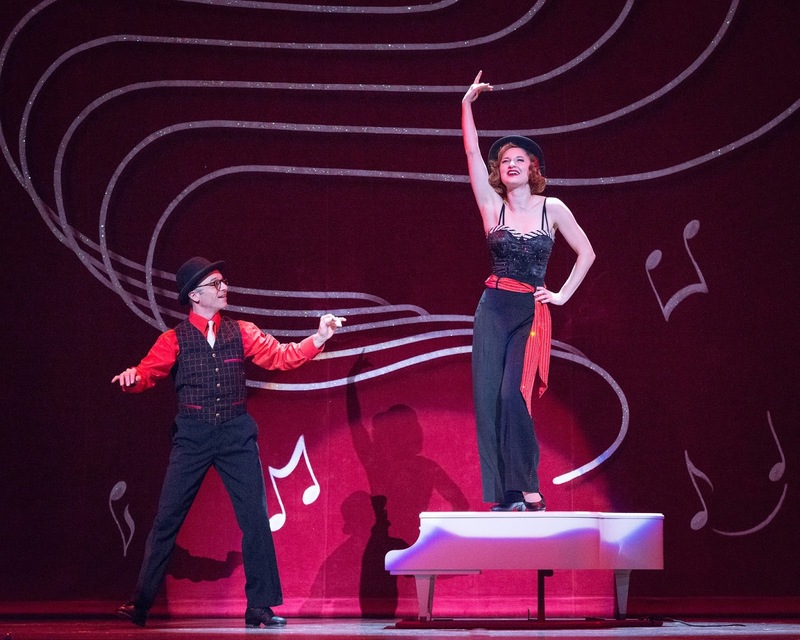 It's a very traditional, family-friendly musical comedy with all the pretty costumes and tap dancing that a show can handle. The small ensemble does a good job of not making the stage feel too empty, but I did wish for more men to round out the scenes where the audience is meant to be made up of the soldiers from Waverly's unit. The nineteen-piece orchestra does a wonderful job with the jazzy arrangements of the seventeen or so songs, from the well-known title tune, "Blue Skies," and "I've Got My Love to Keep Me Warm" to the less-familiar but very charming "Snow" and "Falling Out of Love Can Be Fun." All of the songs are good; Berlin was no slouch as a songwriter. I've been listening to the 2006 cast recording for years and enjoy the whole thing. 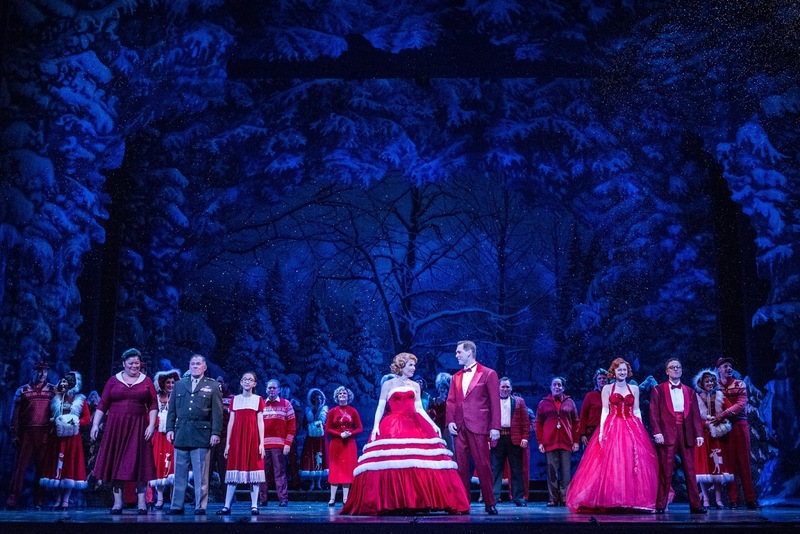 White Christmas is a crowd-pleaser, and if it didn't quite live up to my personal memories of that first Ordway production, it's still an uplifting and entertaining evening of beautiful music and dance. 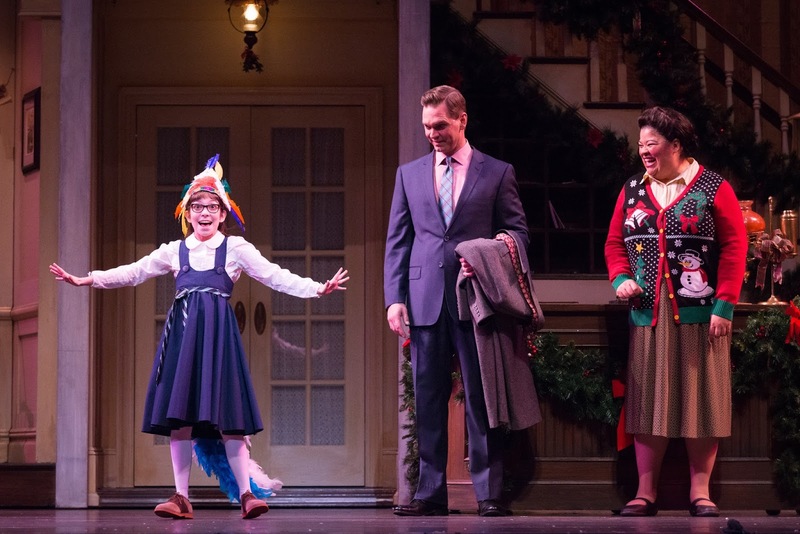 Thinking about the first White Christmas at the Ordway reminded me of these videos that the cast made while they were in St. Paul. It helps if you remember when the Saturday Night Live video "Lazy Sunday" was a big deal. Jeffry Denman played Phil Davis in that production and headed up this project. There are even follow-up videos from 2007 in Boston and the 2008 New York production, if you're into theater people being weird. Also, Denman wrote a good book about a year in the life of a working Broadway actor called A Year With The Producers: One Actor's Exhausting (But Worth It) Journey from Cats to Mel Brooks' Mega-Hit. When I looked to see what he was up to these days, I found this nifty video of "Cool" from West Side Story, danced all over Central Park. Glad to see he's still out there making beautiful things.